Sounds simple doesn’t it. A try before you buy for both the applicant and employer based on personality – no cvs, employment history etc. With 116 success stories, we want more. Amongst this 116 are people from diverse backgrounds – homeless, graduates, no education, solid employment history, no employment history, mental health issues etc. This unique business funded initiative has seen diverse success studies. There is a wide talent of unemployed people hungry to work and willing to learn. Employers can’t see this talent in a short interview/assessment. So we are spreading the work with a poster campaign. Some things really aren’t too good to be true! You just have to give it a go and see for yourself! 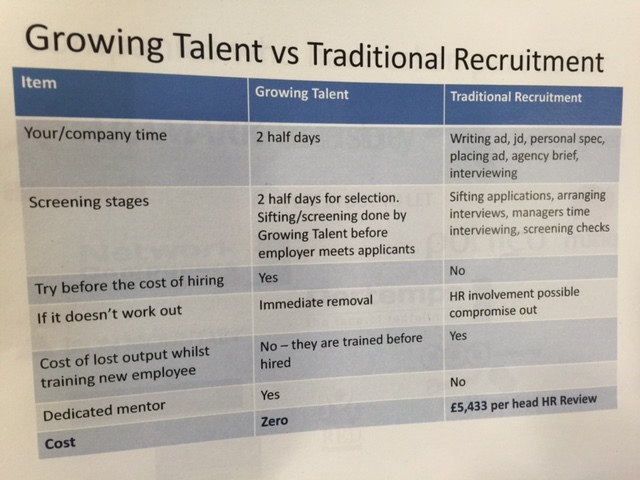 Although the cost table below shows HR Review’s breakdown of traditional recruitment costs from 2014 – it’s logical to believe these have risen over 3 years. One solid fact the display below shows is Growing Talent remains completely free! Check out http://www.growing-talent.co.uk and @Growing_Talent for more information. Next Take a minute to think…..